The Department of Energy's National Renewable Energy Laboratory (NREL) on Jan. 20 released its latest report on U.S. and global renewable energy. Published annually, NREL's 2013 Renewable Energy Data Book reveals new renewable electricity accounted for over 61 percent of total new U.S. generation capacity in 2013, rising to represent nearly 15 percent of total installed capacity and 13 percent of total U.S. electricity generation. Worldwide, renewable energy resources accounted for 23 percent of electricity generation. Solar electricity was the fastest growing segment of U.S. electricity generation technology: Cumulative installed solar electricity capacity surged nearly 66 percent higher in 2013. "The 2013 Renewable Energy Data Book is an important resource for policymakers, analysts and investors worldwide," Sean Esterly, an energy analyst for NREL, was quoted in an NREL press release. "Renewable energy trends are displayed in an accessible format for a variety of audiences." Overall U.S. energy consumption rose 2.4 percent year-over-year in 2013 to total 97.3 quadrillion Btus, according to NREL's 2013 Renewable Energy Data Book. Consumption of renewable energy and coal-fired power plants rose slightly during the year while energy consumption from oil and natural gas fell slightly. 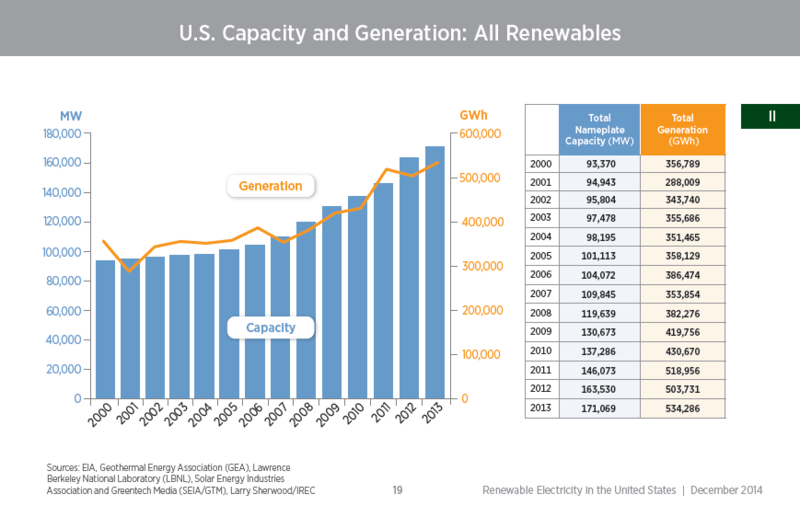 Renewable electricity accounted for more than 61 percent of all new U.S. generation capacity additions in 2013. That compares to just 4 percent in 2004 and 57 percent in 2008. Cumulative installed solar electricity generation capacity increased nearly 66 percent in the U.S. in 2013, making it the fastest growing electricity generation technology in the country. Solar PV accounted for about 63 percent of new renewable electricity installations in 2013. Cumulative installed solar PV capacity surged nearly 65 percent – from 7.3 to 12 gigawatts. Installed CSP capacity rose by 81 percent, from 0.50 to 0.90 GW. Wind-generated renewable electricity increased by 20 percent in 2013 as wind farms completed in 2012 came on-line. New wind electricity capacity rose just 1.8 percent, however, a marked slowdown that in large part resulted from the expiration of the federal wind energy production tax credit (PTC). Renewable electricity from biomass, geothermal and hydro power remained stable from 2000 to 2013, according to report. Combined, electricity generation capacity from these sources rose over 9 percent over the period. U.S. hydro power generation capacity accounted for half the nation's total renewable electricity generation. Wind accounted for 31 percent, solar for 4 percent and geothermal for 3 percent. *Images credit: NREL, "2013 Renewable Energy Data Book"